Nikki and I flew up to the Seattle area to meet up with some friends and family. On our first night there, we all dropped by a place called Mox Boarding House in Bellevue, which is a board game-themed restaurant / game store. They had a wide array of tasty nibbles and drinks, and Nikki and I decided to start this trip right by getting their Mac and Cheese. 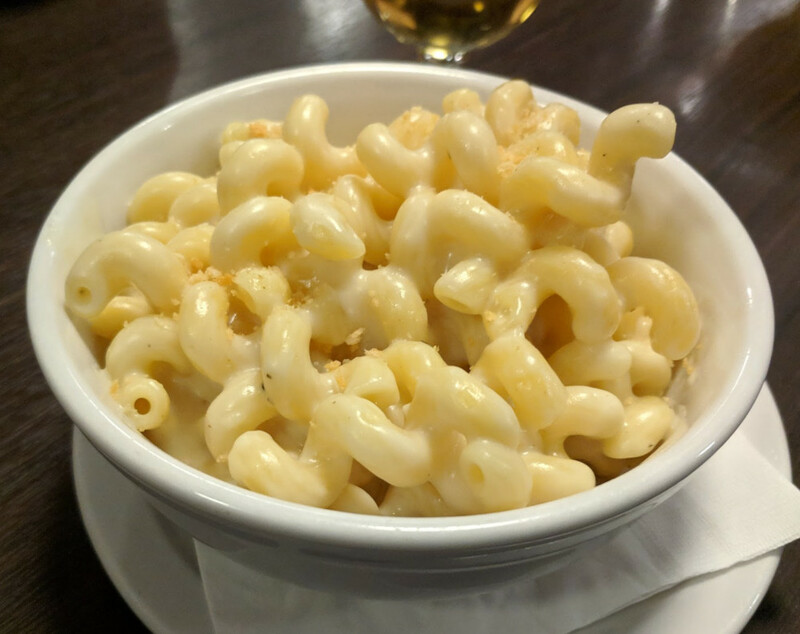 Mox's Mac is yet another "Mac" that doesn't use Macaroni noodles. They opted to use cavatappi noodles instead, which I guess is at least close. The noodles were cooked well, with a decent amount of bite. The sauce wasn't super complex: a simple and pleasant cheddar sauce that did a fairly good job at blending in the cheese flavor. The dish was sprinkled with a few breadcrumbs, but I actually didn't even notice them until just now, when I was looking at the pictures for this post. One of our friends also got their Mac and Cheese, but added bacon to it. The bacon looked fantastic, so if you're getting Mac from here, definitely try it with bacon. :) Overall, reasonable, but not exceptional. Anyway, I'd recommend Mox. Their Mac is alright, and they also have a wide array of stouts and meads. And board games! This place had a wide selection of free games that you could borrow. And this location also had reservable rooms hidden behind bookcases and stuff. It's definitely a neat-o experience.